Comparison Through the Eyes of a Runner. This week was one where everything hit at once: the knowledge that senior year is beginning, the realization I should start job hunting, desire for the hard part of the summer to be over, feelings of loneliness, reversion back into some unhealthy thoughts, feelings like my blog is a failure etc. It’s been a week where I haven’t felt motivated but felt compelled towards the future. As my friends all gallivant around the world, NYC, and other hubs of business and internships I can’t help but feel as though I’ve fallen short. I don’t have the corporate internship, or even one that will look too impressive. I don’t have the means or time to gallivant to South America for a few weeks. I don’t really have too much to add to my resume and this is scaring me for next year. However, heart knowledge (feelings) and head knowledge (fact) and two very different things. All this things are feelings and the fact of the matter is, in a year I will have a Wharton Business School degree, I will have spent 6 months in Australia, interned with a wedding planner two years, had a marketing internship, become a published writer, learned more than I ever thought possible about myself, run a marathon and determined what I didn’t want to do in life. These things may not be the internship on Wall Street, or world travels every summer but it will be enough. I realize when I begin to feel like a failure it is due to the fact I am measuring myself against what other people are doing. When what I really should be doing is measuring myself against what Christ wants from me and what my dreams desire. I am wonderful, and even though as I type those words I don’t feel it, God made me beautiful and perfect and loves me. He also has great plans for me, I just have to be patient and wait for them to be revealed to me. I looove your blog! It inspires me. And, from my perspective, you have things together! I usually feel like I’m nuts going back to school after having been out for years. Especially since my goal is DPT and there is a long road ahead (why didn’t I figure this out sooner???). I’m sure you will do great as you finish up your degree and look for a job! Thank you so much for your constant support Jen!! DPT is amazing and will be so worth it in the long run! You can do it!! Thanks! At the rate I go some weeks, I think I’m going to be my own patient by the time I reach my goal! It sounds to me like you are doing awesome! I really like the version of that verse you quoted. 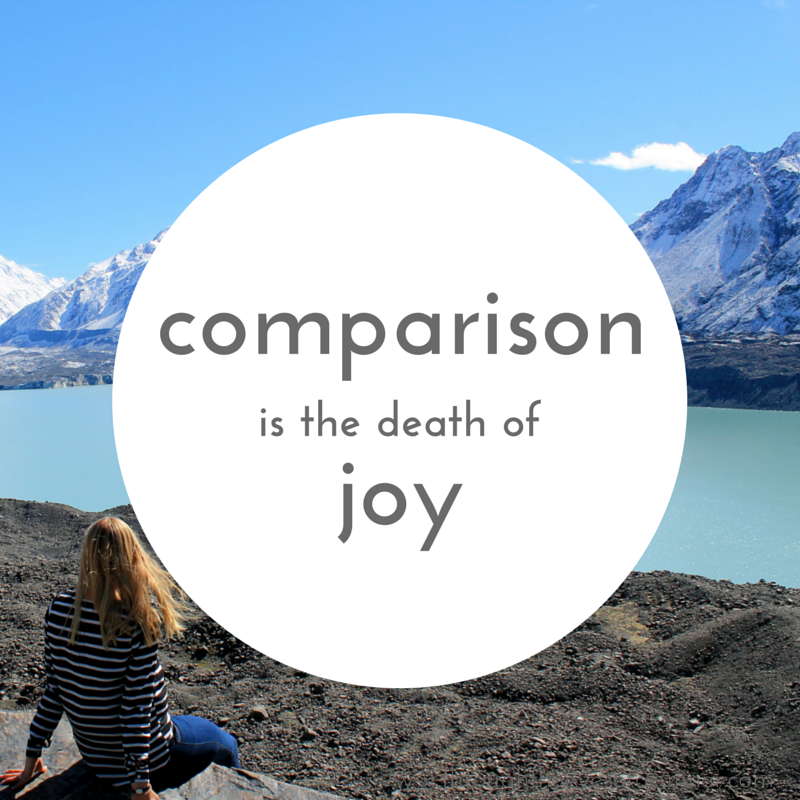 I’ve heard it as “Comparison is the thief of joy,” but I like the word death in there instead. It makes it much more powerful! Comparison really does kill our joy. Thanks for reminding me of this, and keep up the good work! This was my first time visiting your blog but I love it so far! Thank you so much for stopping by Jenna!! It is something we must always remind ourselves: we are made the way we are for a reason! Wow. This post was beyond what I needed, as someone who struggles with comparing often. Thank you! Can’t wait to read more! I’m so glad it helped!! Thank you so much for stopping by, reading, and your support! Comparisons will always get you in trouble, and it seems as if you realize that with your mind, but are having trouble dealing with how you feel about them. The feelings are only temporary and will change, but the facts will not. You know what the reality is, so just focus on the positive, take a run, read your Bible and pray. And your blog is NOT a failure! Great post! It’s so hard not to compare, but it does take away from our happiness for sure. It sounds to me like you’re on a great path and have exciting things coming up! Thank you so much Kristen! We must remember this everyday, right?! Wow, this is such a great post! Great post and so very insightful! I wish that all people had that same mentality…to be happy with who they are because God did not make a mistake. Great message for all of us to carry with us. Thank you so much for your kind words and support Shelley!